Our Kootenay adventure started with a lovely piece of land and a gross moldy trailer. We started with gardens and chickens, built woodhenge, and a new road, two yurts, then a lovely outdoor shower house. We added hugelbeds and food forest systems, amazing onsite fertility programs, then came the rabbits and the bees. A cob rocket oven and a cob bench with outdoor kitchen space in the garden even a new green house. Perennial food abounds and now we are surrounded with community fresh water and love. Two years ago I took the advise of my friend and permaculture teacher Rob, he suggested I forgo the WWOOf’ers I was thinking about adding into the fold and look for folks who share our permaculture ethics and could really embrace and explore the techniques we are playing with here. So in 2011 I offered Permaculture Internships for the 2012 season, and for the past 21 months we have had continuous interns living with us. Today is the first day Since Feb of 2012 that we are without interns, namely without Jordan. Jordan came here back in April of 2012 bright eyes and eager to live in the mountains and build on the solid permaculture education foundation he had. His 6 week commitment soon passed and we all decided that the energies we had as a team were worth holding on to. All of our interns came and went for the season and Jordan was integral to their orientation and settling in. Actually he was integral to just about everything around here, our fertility program was ramped up 10 fold as soon as we teamed up on the pitch forks! Jordan has a great ability to retain just about everything he reads (I am more of a skimmer) so having him drop facts and stats on a whim was always amazing. Jojo made all the crazy permie dreams totally doable, especially when he introduced us to his white board system of tasks and goals. Every time I dreamed up another event or community project or planting guild idea, Jordan was there to back me up, or take on the challenge himself and ace it. Not only is he a kind and amazing person we were thrilled to have here, he had also become my personal spell check / proof reader… you all can probably see by now how important that role is to me, as I’m a copy editors worst nightmare! At the end of the harvest last year we took on a big project, out biggest ever and he was eager to stay through the winter and we were thrilled to have him, he was after all part of our little family by then. Together we starting creating our internship program for the coming season and soon realized, although we were overwhelmed with amazing applications and emails, we were going to build on the family we had made with Jordan. We invited his CSA team from years early to join ours and took on the lofty task of housing 3 full time – 3 season interns. It was still snowy when Dave arrived from Victoria, and he was keen to chop wood, haul trees, wild craft and hone some carpentry skills. Jordan and Dave were living in the “Murt” together and built a really great loft space. Dave brought us music, and a good dose of laughter. Dr Kombuchy start brewing kombucha for all of us and caring for all the little critters and wee seedlings. We started our (2nd attempt) and breeding rabbits; we had a buck and 3 does and Dave took on that process entirely; from salvaging scraps of everything to assemble their new bunny palace, through the the daily care. Dave was a vegetarian when he arrived, however he was moving toward eating meat from small, local, organic and loving producers which was totally inline with the way we eat… he was in for a big surprise however when our little piggie, Bacon (raised by our friend) was ready for market shortly after Dave’s arrival. Poor guy sat nearby and watched me use every grueling nasty bit of that pig in preparation for Pig-in-a-day. Wow that was a tough 3 days for everyone; Dyl and Jojo did the killing and the skinning and scraping, and face peeling, and I boiled the heads and prepared the organs then created a workshop for 20+ folks to come and learn from our friend Ben the Butcher how to break that beast down. By the time Isis arrived in the spring there were still remnants of pig… I think she found a hoof buried in the food forest on her first day in the soil! And of course she enjoyed the smoked bacon we were serving. Isis came along to the farm right around the time that Jordan brought home Balou, son of Odin (our golden guard dog) and soon the 3 of them; jordan Isis and Balou were all sleeping outside in the wood shed and Dave had the yurt to himself. Isis was a magic addition to our growing team. Her days were often spent tending to the garden, weeding and planting, and most importantly observing! She is a stellar observer. Isis and I decided before her arrival that this was the time to finally take on bee keeping.. something we both so wanted to do, so together with the help of some serious queen bee guardians; Elise and Christina, we had the confidence to welcome and care for our new holistically managed bee colony. What a joy. Isis also came to be my number 1 dishwasher (feeding 6 meant for lots of dishes), and wild crafting and harvesting goto. I soon came to know that tone in her voice “…and the cucumbers” this meant I had many a basketful she was hoping to bring in and have me process in short order “the squash, the tomatoes, the grapes, the cabbage (the blue ribbon cabbage that is)…” the list goes on and on. We had our most productive and abundant year ever and this I blame heavily on Isis and her garden fairy magic. As harvest wound down and the wood supply stacked up it was time for Dave to move on, back to the coast again with a soul-craft stop over. Dave is working with “Farmer Mike” (who I look forward to meeting someday) doing urban farming in Victoria. Maybe Dave’s most important legacy he left in the Kootenays was our daughters new interest and skills in music namely the ukulele and the songs they rocked together at open mike! Dave we raise a cup of turmeric tea to you, and wish you nothing but the best. love + gratitude to you. Isis and Jordan are back home in the rambling foothills of Alberta now ready for a new page in their adventure together. With a heated home (novel idea) and lots of land to craft and observe, manage and care for. Our community’s loss is Black Diamond’s gain. Those two will do great things together. Jordan, Isis we love you both so much, and can’t wait to see how your future evolves. We wouldn’t be here without everything you have done to help us achieve our dreams. Thank You! Some of our friends and neighbors are without water to drink, water to grow food with, or water for their animals. Some of our neighbors are still feeling and smelling the effects of the spill in their bodies, in their sick children and in their homes, and our community has a broken heart and is full of hurt and healing. Last nights Public meeting was swamped with hundreds of people, past capacity in the hall and a parking lot full of folks desperate for more information. I left with more questions than I had going in, along with new concerns. This is good audio summary of the events of the night. And this is a recent CBC interview with a local. Big Love and Thanks to the organizers of the River Vigil last night, it was beautiful to have so many folks from the community come together with positive intentions for our fresh healing waters to flow again. 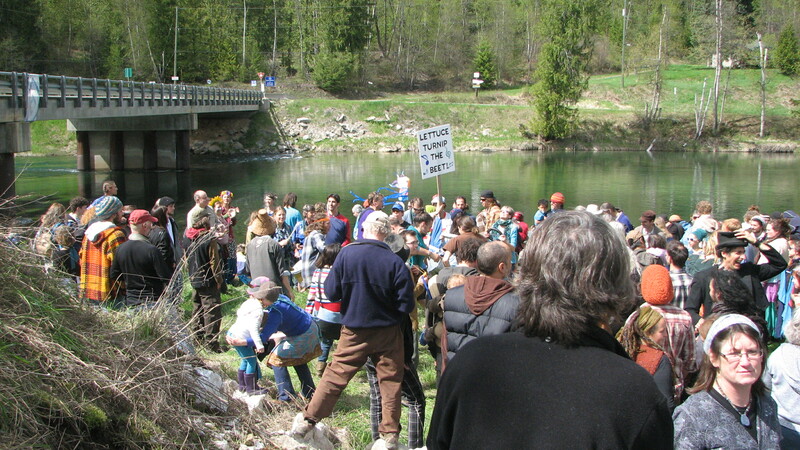 Since the spill happened I have been hearing Bo’s voice singing “down to the river to pray” This image is from 2011 Water Day in Winlaw, our annual river blessing, this is where we gathered last night, while the helicopters flew over head with water buckets destine for the forest fire behind the ridge. We are looking for what to do now as a community. Everyone wants the clean up to start, and to be done with care. Donate to the Slocan River Stream Keepers, Take some food to the firefighters through the fire stations and while your at it take some food to the Sinixt Nation Road block up on Perry’s Forestry Road. It is so important we come together and support all of the efforts to keep our pocket of this planet healthy and diverse. We had such a fabulous internship experience last year that we are happy to announce we are expanding and developing our 2013 program! We are currently accepting applications for 3-6 week internships for the April-October 2013 season. This is your chance to get your hands dirty implementing permaculture principles in paradise! 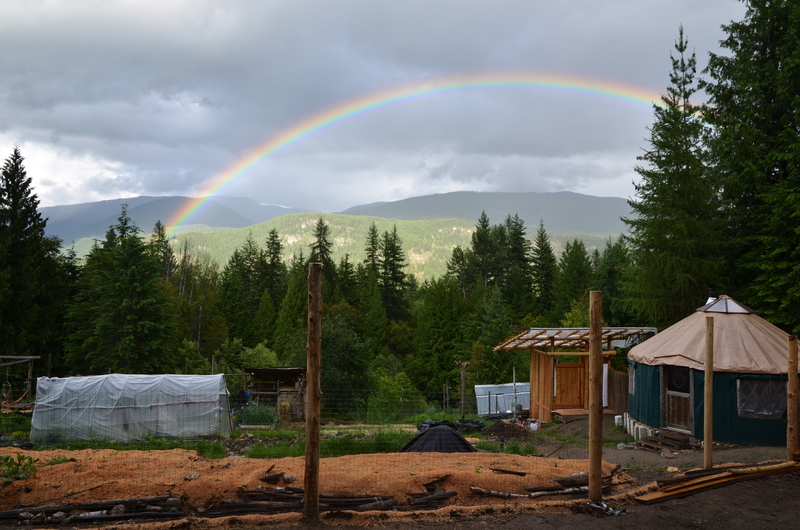 We are going into our fourth season of growing food and building here in the Kootenays, and are looking for eager and hardworking interns to help us implement more permaculture techniques, test theories and explore new integrated systems. Essentially we want WWOOFers who want to dig in to permaculture hands on! We have 1/3 of an acre of organic primary gardens, which employ many interesting techniques; guilds, sheet mulch, companion planting, herb spiral, hugelkultur, etc… along with a newly guilded fruit system, the foundation of a food forest, many established fruit trees and vineyards, 2+ year round creeks, and over 6 acres of mossy diverse mushroomy forest. Our projects this year have been broken down by season (see below) and we have a pretty clear-as-dirt idea of what we’ll be doing in these time blocks, and encourage applicants to consider activities and timing when applying. We currently have 26 laying heritage hens, as well as 2 working dogs who keep the beasties away (bears, coyotes & cougars to name a few). We have a pig who is currently living off site, but will be joining us here in the early spring for some rooting work and then as a key participant in a pig-in-a-day butchery class. We plan to expand our animal systems again this year, including rabbits (round two), as well as ducks and a pond system. As a tricycle acre intern you will enjoy mainly vegetarian from scratch home cooking but the occasional ethical omnivore meal makes it’s way to the table (unless of course you don’t eat meat then we can easily accommodate this). The focus of most every meal here is eating seasonal organic and local whole foods. Your host is passionate about food and blogs regularly at eatingwithSOLE .You’ll drink and wash in living mountain fresh creek water from the source, and enjoy a magical forest full of wildlife, wild edibles and medicinal plants, right in the heart of the Kootenays most diverse and wonderful community, with it’s ample art, music, learning living events, Rivers and lakes, beaches and mountains to explore. Your hosts have a wealth of knowledge to share: Shauna is a Certified Permaculture Designer, and Dylan is a Master Carpenter with skills in fabricating just about anything out of just about anything. Shauna was a successful bakery owner in her city life and is passionate about cooking, baking, canning and food preservation, gardening and fiber arts. Together we have a good amount of alternative building experiences including: undertaking an earthship internship, building with straw bale and cobb, composting toilets, waddle and daub, yurt building, log building, and of course our favorite building material… GARBAGE! We are a young small family eager and open to constant learning and exploring of new ideas. We also have an extensive permaculture / building / growing / cooking / primitive skills / fiber arts library which can be accessed during your stay. We also have an extra canoe and bicycles interns can use on hot and sunny days off. In 2012 we hosted 8 interns throughout the season and enjoyed the ups and downs of growing food and building in rain and sunshine, and have more than memories to show for it. Accompanying us throughout the 2013 season will be our farm hand Jordan who came to us as an intern last April and hasn’t left! He brings a solid and broad foundation of both permaculture theory and hands-on implementation experience. Jordan is a Certified Permaculture Designer and has extensive knowledge in soil building and composting, building and site layout, and alternative agricultural and has experience with a wide array of permaculture principles and techniques. He is now heading up our internship program and has become an integral part of the Tricycle Acres team. Applicants should have reasonable amount of permaculture knowledge, and should be physically able to dig, shovel, lift and haul heavy piles of materials (largely organic inputs). Applicants should also be prepared for near off grid living; no TV, limited internet, limited access to power, be comfortable using a composting toilet outhouse, and a dreamy outdoor shower house. We expect interns to not create or bring unnecessary wastes onto our site. We expect any intern to follow the permaculture ethics, and understand that those are our guiding principles. Interns would work 5 days a week, approx 5 hours a day weather and project permitting. Lunch, dinner and accommodations are provided, but interns will need to prepare and provide their own breakfast and are responsible for all of their own dishes, as well as contributing with cleaning and dishwashing in the kitchen (to keep your cook happy). Interested in applying? Download the pdf Application Info Sheet to check out the process below… our deadline is >>> EXTENDED<<< April 1st! Here is the first of 11 videos the Leaf Ninja’s made, featuring all the great things Verge Permaculture Graduates are doing in the world. Luke and Kai came out and spent some time hanging out with us in the Koots. They filmed a feature on both Jordan and myself, along with 8 other graduates. Slowly they are being released so be sure to watch for the whole series: The guys did a FABULOUS job with the videos, both filming and editing. Well done! May the sun gently warm the seeds you sow in the fertile and living soil, may the rains delicatly sprinkle and feed the plants in your field, may the winds strengthen their stocks and entice our flying friends to do a pollination dance upon their petals. May your harvests be abundant and your table full of people to share it with. And may the sunshine of the summer season invigorate and refresh your spirits. I know I have mentioned a few times already that we are hugel-ing a part of the new garden expansion… well the other day we finally got the bed underway! We started by staking out a contour line, and as we are building it on a hill side, we pounded some pole steaks into the ground to catch the load of the first and largest punky tree trunks, then we neatly stacked more and more woody materials (which we have been hoarding in hugel stacks for months) generally building the stack from biggest pieces to smallest as we went up. The overall shape is a long pie wedge that acts as the boarder from the road way to the new terraces. The following day we utilized our new gravity spring fed water line and really saturated the mound, which made for a nice refreshing sprinkler cool down as we worked on a small excavation about 12 feet away in the beating heat. Having a hugel dump site directly behind a earthen excavation was peachy! All of the roots and twigs and duff we pulled out easily made there way to the mound. What a lovely way to use us massive amounts of wood bits and bobs; branches punky stumps, rotten birch branches, roots, twigs, leaves, pine needles, old straw well packed in chicken manure, the contents of many pee buckets, leafy duff, pine shavings, and sandy soil from an excavation… what does this all amount to? A self watering nutrient rich raised bed, that may even ward off the kouch grass for a time! Check out Paul Wheatons Great hugelkultur Page full of diagrams and pictures of more examples of hugels in action! Our hugelbed will will planted out with squash and chickpeas, all of which will be heavily mulched of course. As we work on building good soil it will be exciting to watch it grow! On the topic of mulch; For the last couple years I have used a great amount of straw to mulch all of my beds, but struggle with the fact that it is not even close to local out here, it’s expensive and has been pretty seedy in the past. So what is our local counterpart to straw? Well it’s wood chips my friends! Lucky for us we have a friend who owns a small (this is a relative term) mill just down the road and he is swimming in wood chips and shavings, he gives us the word once he has run pine or fir and we head down the road 5 minutes for truckloads. I like the look of the wood chips in the garden, and on the occasion of a chicken assault on the garden the birds seem less drawn to the wood chips than they are to straw! Best of all it’s free! We will add more pictures as we get the bed planted and it starts to grow and we get underway the next garden bed projects: sheet mulch key hole beds! On the topic of sheet mulch: Way way back 3 spring times agao, when all we had here was a waving hillside of kouch grass I eked out one 80 foot long bed using a lasagne or sheet multch technique. I built that bed right ontop of thriving fresh kouch grass, and still to this day it is one of my favorite and most nutrient rich beds in the garden. The grass is managable and not so vigorous and I feel like this is a really viable option for working with weedy long routed grass challenges! There are some things I have learned about that bed and my material selections I am set to improve this go round. *** I am so stoked to have so much great news to report, having all the extra muscle and brain power around here is fabulous, we are making HUGE steps forward in all manor of food and human systems. Jordan erected a great shower house next to the yarn yurt and we finally got to use the bamboo walls Dayna gifted us last year for the task, The shower has a sturdy peeled pole bench and a pallet deck floor. We will have a double sink next to it for all manor of garden / toiletry / and kitchen camp uses both will be heated with a hot water on demand unit designed for outdoor camps. The open air view from the shower is wonderful and I can’t wait to jump in an enjoy a sunny outdoor shower! Phil and Jordan hauled no end of big @ss boulders around today, improving access after days of bobcat disruption! We now have a raging water line across the garden and to the yarn yurt, and that was no small feat. Dyl had to learn how to drive a bobcat backhoe to get 140 feet of new water line in place, and that task was an all hands on deck pick axe-shovelling-racking fiasco! I kept singing “laying pipe all day long” and acknowledged that never before have I had 3 men “…working so hard to satisfy this woman”! Yeah for water, and bobcats, and bamboo showers, and perky plants who loved the vermi-compost tea treatments!! !